This is my first "string quilt or scrappy quilt". I've decided that I would like to make it for my king size bed. I need ideas to expand these 5 1/4 inch blocks. I currently have about 150 of them. But I won't have enough to just join them together for four patch blocks. I will probably just keep making more until I figure out something and run out of fabric!!! 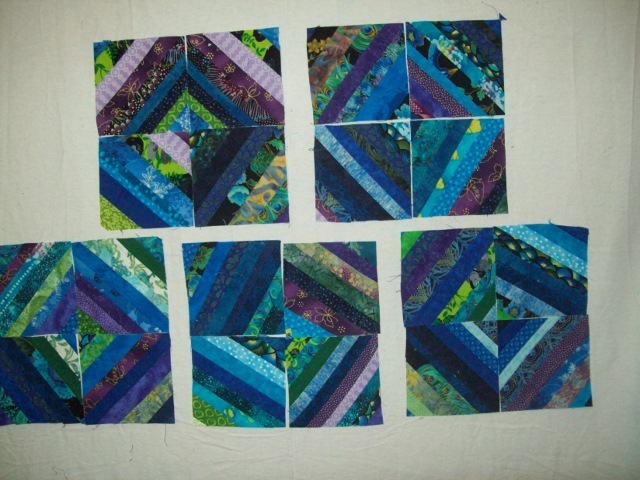 To maintain the design, perhaps sashing around a set of four blocks is a great way to expand a block. I've seen some sash in a small way, say about 1/2" between in the center of the four patch blocks, creating a "+" sign, then larger sashings surrounding the 4 patch blocks. Multiple sashings giving it a log cabin effect is another way to enlarge. You would actually be using your blocks as the log cabin center. The blocks could be as large as you want. Another idea - use a really large sashing & incorporate some applique or embroidery on the strips. If you have a focus fabric that incorporates your colors, you could actually do some "big blocks" and do some elegant designs with that, using the 4 patches of yours & 1 big block in an offset design, thus making an "x" type effect in your quilt. Pinwheel blocks are fun ways to do an alternative quick block to add another design element to your design. I do like your blue blocks. Let us know what you come up with. There are so many different ideas for scrappy quilts. Bonnie Hunter's site quiltville.com and quiter'scache.com is another good one. I ordered some stuff from Hancock's of Paducah last week and noticed this peacock. Beautiful! I think it would look great with your blocks. By the way, that quilt you made your DIL is gorgeous! I used string blocks to make columns. A full lenght white piece, then acolumn of string blocks all the way down The width or numer across is up to you) then a length ofvwhite, then blocks, etc. It turned out really sharp. I have no pictures - my son was here when i was taking it out of the dryer and claimed it immediately. I was going to suggest what Sewmary just said. Good luck and have fun! What a great idea to use a panel in the middle or along one side like the quilt shown. Also like the idea of a white panel between the pieced blocks. This board always comes to my rescue. :-) I have learned so much from everyone. I think whenever new quilters ask for advice in quilt shops or in classes, it should be suggested that they join this Quilting board! Love the idea of a peacock center. Can't wait to see it finished!!! I am fairly new to this board and have learned so much from all of you. I have recommend this board to several friends of mine. Thank you all very much for your knowledge. I, too, agree with gramquilter2. Wow! That's beautiful. My first thought....and, why is she asking for advice! Doesn't seem like you need it your work is so fantastic. Thanks for sharing this quilt. I used string piecing as a border. I saw this fabric on eBay - Emerald City Fabric and Craft is the eBay store name. It is $10.48 per yard. I have purchased fabric from them before and so far have been reliable. It is so beautiful, I may have to buy some to try myself, but I am so not in your league of quilting. Your quilt is really beautiful. I am no good at this but I sure understand your feeling of being kinda stuck on a project. I don't follow patterns too well so I spend a lot of time looking at a design wall and coming up with ideas. Good Luck! Let us see what you do with it. That line also has a new panel, a tree of life which is just gorgeous. Happy Apple Quilts has it in their online store and their shop. 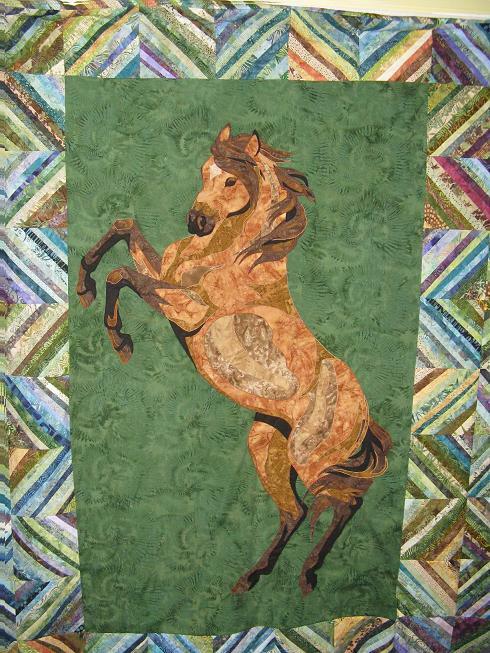 Love the border around that beautiful horse Applique!!!!! Applique, I love the way you placed your blocks in the border. I would have never thought about that being so pretty. I've never been crazy about the string block quilts, but I love this border. Your whole quilt is pretty. The Tree of Life is also on eBay. One way to really make your quilt bigger is to put the blocks on point . For example your 5 1/4" blocks putting 4 together would make a (about ) 10" block which turned on point would make a 14" block. Beautiful colors! good luck. Show us what you decide! Applique - what a great way to use string blocks!. and the horse in the center is awesome! 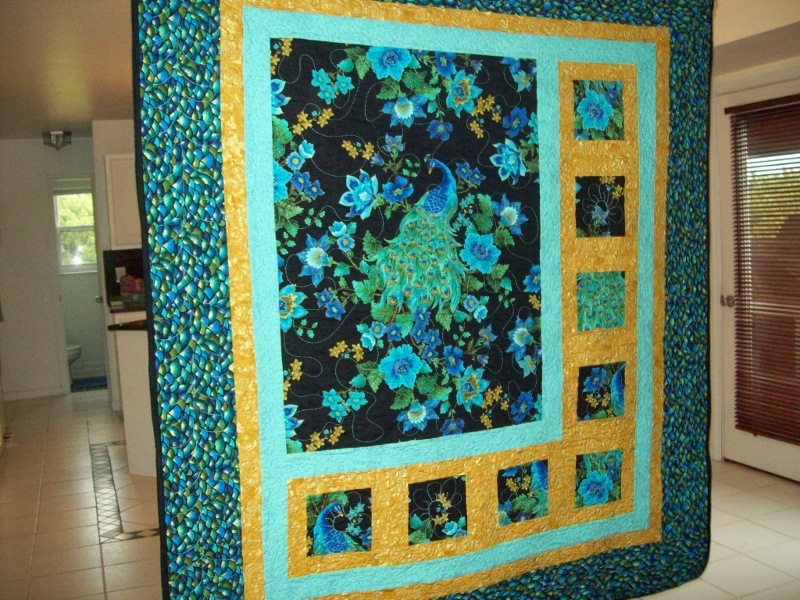 I love the colors, the peacock quilt is beautiful!